Raised by a single Mother who started a Consignment clothing business in Ardmore when she was 7, they struggled financially like most do but persevered with hard work & Determination (and maybe a little child labor haha). Working after school and all through high school, Bargainlady taught her the Value of customer service and a passion for helping people. Learning over time that the word NO … is not actually a NO … It just means work harder, follow up, and make progress! Young and ambitious Kori had a unique passion for Real estate at an early age. Unsatisfied with the struggle of living paycheck to paycheck she started educating herself on what every 19 year old is interested in …. You guessed it rate of return! She bought her first house when she was 19 years old. Googling and self-teaching anything and everything she could learn about the Real Estate Industry. She soon realized it might be hard for Realtors to take her seriously as a 19 year old, so she got her Real Estate License to ensure she wouldn’t miss out on those good deals! 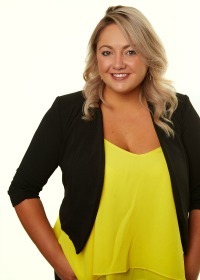 Now with over 21 Million dollars in sales volume Kori has worked her way to be known as the GO TO Realtor in Ardmore!